Complications from phlebotomy mistakes include loss of arm mobility, grip strength, and long-term pain. This page discusses phlebotomy malpractice cases through the lens of a lawsuit that was filed against a John Hopkins phlebotomist. This is a phlebotomist malpractice case against Johns Hopkins. The victim was allegedly injured donating blood in anticipation of a bone marrow donation. A Stafford, Virginia woman goes to the phlebotomy lab at Johns Hopkins Hospital in Baltimore, Maryland. She is scheduled to give an autologous blood donation in preparation for a bone marrow donation. When the phlebotomist places the needle in her right arm to initiate the donation, she immediately feels pain and numbness causing her to yell. A resident physician tells her that the needle likely struck a nerve, and advises her to call back in a few days if the symptoms persist. After experiencing several days of pain, numbness, burning, and tingling, the woman contacts Johns Hopkins and is referred for evaluation and treatment. After evaluation, it is determined that the woman suffered an injury to the lateral antebrachial cutaneous nerve in her right arm. This nerve is the sensory continuation of the musculocutaneous nerve which supplies the flexor muscles of the elbow. Notwithstanding medical treatment, medication, and the passing of time, the woman continues to experience neurological symptoms in her right upper extremity, including pain and numbness. She is still undergoing regular medical care and treatment. The woman files a medical negligence lawsuit against Johns Hopkins Hospital in Baltimore City, alleging that it violated the standard of care by failing to take reasonable care not to strike a nerve in the woman's arm when inserting the needle to draw blood. She, along with her husband, also file a loss of consortium claim. The woman continues to experience significant pain, numbness, disability, loss of enjoyment of life, emotional distress and loss of wages and wage-earning capacity as a result of her injury, which is likely to be permanent in nature. When you give blood (a larger needle is used donating blood than in regular venipuncture) there is a risk of nerve injury even when the phlebotomist follows the standard of care. It is a blind poke into the arm or hand and the phlebotomist cannot see every possible structure that the needle could hit. In other words, many of these phlebotomy nerve injuries occur in the absence of negligence. The harsh reality is that most of these cases end in defense verdicts. That said, there are a number of things a phlebotomist can do that is a breach of the standard of care and these can be very viable cases. Many phlebotomy lawsuits follow when the phlebotomist stray without a good reason from the median cubital vein. Draws to the median cubital veins are greatly preferred because they are closer to the surface of the skin, more stationary, and involve a less painful needle insertion. Accordingly, draws to the median cubital vein are less likely to injure nerves even if needle placement is not optimal. The basilic vein is tempting because it is easier, but it should be a last resort because of the risk of injury to structures in proximity to the basilic vein, i.e. the brachial artery and the underlying nerves. Similarly, drawing blood from the hand is considered an advanced phlebotomy procedure. Hand draws are recognized to have an increased risk of injury to the nerves of the hand. This procedure should be avoided whenever a vein in the arm can be accessed. The angle of the draw also matters. The standard of care says that an insertion angle of 15-30 degrees is optimal. A low angle goes a long way toward minimizing risk. We summarize a lot of lawsuits on this website. This page gets a lot of visitors. A lot of people get injured during the blood collection process. 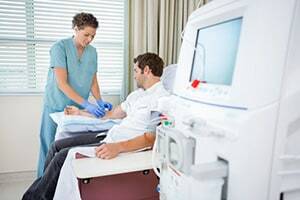 If you are reading this and looking to bring a lawsuit against phlebotomist, you do need to understand that most injuries during blood collection do not result in a viable malpractice case. If you have been a victim of a doctor's mistake, our Maryland medical malpractice negligence attorneys can help. We handle serious injury and wrongful death cases. Call us today at 800-553-8082 or get a free, no-obligation online case review. What is the value of a medical negligence claim in Maryland?